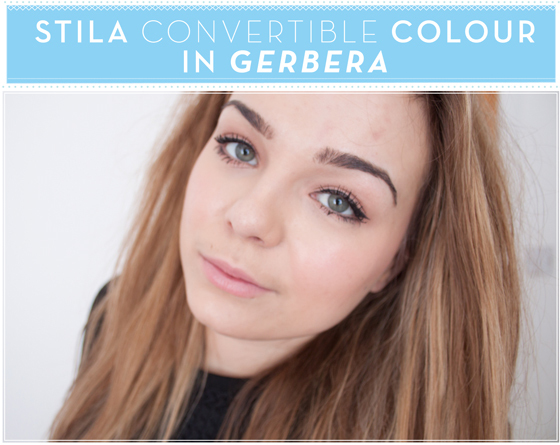 I've had my eye on acquiring one of the Stila Convertible Colours for a while and thought it was about time I got around to buying one. I've never seen anything from Stila in person, so I bought Gerbera blind. By that I mean I didn't actually look at swatches before I bought it, which is surprising as I tend to always read reviews or swatches before buying something. It was a spur of the moment purchase! I've been very much getting into my cream blushes recently and I always hear about Convertible colours so I thought I'd give it a whirl! Convertible Color's have a real luxurious, creamy texture which is super easy to blend. Gerbera is a very natural light neutral pinky peach shade which is right up my street. It melts perfectly into the cheeks to give a soft flush of colour without looking heavy or too much. You can use as much or as little as you like depending on the ammount of flush you'd like. I tend to apply a little at first and then build it up as I feel it can get quite pigmented if you go in with too much product. On first use I did feel that the product was a bit tackyt and that it just wouldn't look very nice on my oily skin. However I found it didn't leave my skin looking blotchy, patchy or greasy at all which left me pleasantly surprised. When I apply to the cheeks I pop a few dots with my fingers then blend out with the Real Techniques Expert Face Brush. When applying to the lips I just dab it on with a finger, although I like the colour on my lips I just feel like it doesn't sit very nicely on my lips. It's not drying but it just feels a touch suffocating which I found hard to wear. I can see this generally being used as blush. Very pretty and very easy to apply!